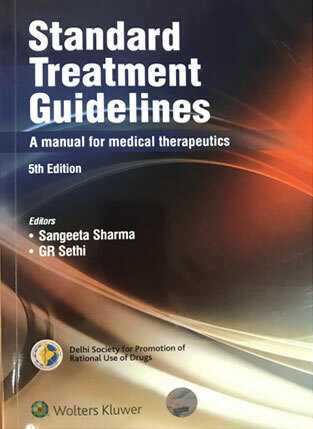 To guide you in identifying and treating common disorders, delhi society for promotion of rational use of drugs (DSPRUD) and Wolters Kluwer health have published this fifth edition of standard treatment guidelines. A practical book on managing the patient. This clinically oriented text covers more than 330 priority diseases in 11 specialties, focusing on clinical manifestations, patient management and patient education and offers you expert information you can use immediately in your clinical practice. Many more priority diseases have been added, besides substantive revision reflecting therapeutic advances. Dermatology section has colour photographs to facilitate diagnosis. A large number of experts have contributed in this book to help solve the problems you encounter in everyday practice. This user friendly ready recknor provides holistic and up-to-date evidence based approach to step-wise treatment for busy practitioners as well as interns and residents. Importantly it also step-down treatment. Thus saving more time to establish accurate diagnosis and communication with the patient. We hope that this updated edition would be useful to the clinicians in providing a standardized care to patients, reducing inappropriate variation in practice, thereby improving patient safety and patient outcomes and promoting cost-effective and quality care.. This book offers expert information you can use immediately in your clinical practice. A busy clinician can thus make an informed, effective patient management decision for different levels of healthcare, from primary healthcare to detailed protocols for tertiary care healthcare. This book serves as a ready reference for healthcare providers and supply management staff. It has been indeed a matter of great delight for me while going through this monu-mental, painstaking scientific work by Dr Sangeeta Sharma & Dr GR Sethi. "The book Standard Treatment Guidelines - A manual for medical therapeutics", 5thEdn, 2018. The book has given exhaustively covered most of not only common emergencies, poisonings and diseases in the field of Medicine, Surgery, Obestretics & Gynaecology, Paediatrics, Ophthalmology, Psychiatry, Gastroenterology, Otorhinolaryngology, Neurological and Neuro-Surgery, Genitourinary system, but also comprehensively covered day to day cases of Cardio-vascular system, bones and joints, blood disorders, hormonal disorders, parasitic disorders and dental diseases. Authors have included common Psychiatric disorders and emergencies also, which will be very useful for medical fraternity in dealing with psychiatric cases in hospitals where services of psychiatrist is not available easily. Adherence to prescribed line of management of clinical cases in OPD and IPD is not only a professional and ethical requirement, but also it is becoming mandatory due to laid down Standards for accreditation / certification in NABH for public & private sector Health Care Organizations and National Quality Assurance Standards (NQAS) for Public Health Facilities i.e. District Hospitals, Community Hospitals, Sub divisional Hospitals and Primary Health Centers issued by Ministry of Health and Family Welfare, Government of India (2013-14). In addition due to rising number of medical /surgical care negligence in the Courts all over India and heavy monetary awards imposed against hospitals and Consultants, it will be good to follow the treatment guidelines given in the book. It is recommended that The treatise on Standard Treatment Guideline's, 2018, every Intern, Medical Officer and Specialist, private and public health facility, Medical Colleges, Dental Colleges, Nursing Schools/colleges, hospitals, Nursing Homes and medical libraries must have a copy to read for upkeep and enhancing his /her, professional / institutional technical knowledge 24x7. I compliment the authors for their dedication, sincerity and hard work in bringing out the STG for the benefit of medical, dental and nursing fraternity but community at large. Standard Treatment Guidelines, A Manual for Medical Therapeutics, 5th edition by Dr. Sangeeta Sharma and Dr. G R Sethi , Delhi society for promotion of rational use of drugs published by Wolters Kluwer is a brilliant piece of work.I happen to be a dedicated reader of its third and fourth edition for my day to day practice as a manual and first go to place when in doubt or otherwise.It fills the gap between the best practices and the actual on-ground clinical practice at a primary level. The latest edition majorly covers the most commonly encountered clinical symptoms and diseases with end to end solution with the latest guidelines.In the new edition, the focus on fluid and electrolyte imbalance, Trauma, MCH, surgery, Dental, and Eye is really icing on the cake.The appendices are as useful as ever.The dermatology section has colored photographs which will help the spot diagnosisThis really is a holistic book which i would recommend to everyone and it certainly is a must-have. As a medical student , one of the most common questions we are asked is how to manage the patient. The gist of Medicine and how efficiently you deal with patients all depend on how well you treat the patient. As a final year student , the next task we are up against is internship where we are expected to be treating all sorts of patient. This book "standard treatment guidelines" have reviewed most of the common ailments and diseases that are prevalent in our country and the basic way to treat them. The diseases and their treatment have been divided system wise which makes it easier to study. The concise format but the ever precise and valuable information is a boon to every reader. Not only does it help us with the basic treatment modality, it also gives us a quick overview of the disease. It leaves behind the old cramming up concept; and helps in the better understanding of the disease as a whole. This book has definitely helped me a lot and has now become a handbook that I look into for quick reference. The content and writing are on point and something very easily comprehended. I am Dr. Akshaya Bhagavathula, Assistant Professor of Clinical Pharmacy, University of Gondar-CMHS, Ethiopia. I am writing to you express my sincere thanks for reviewing my first meta-analysis on Indian Pharmacovigilance which is recently reviewed by you and published in PLOS. I still remember the book on Rational drugs published by you and have a copy of book with me always as a reference. I feel honor taking my paper review by one of the leading medical emeritus of India. Kindly accept our sincere thanks for your constructive review and highly appreciate your suggestions as student of you.